Wear the symbol of love closer to you with this elegant heart-shaped pendant, lined with round brilliant diamonds and baguette cut diamonds totalling 0.15ct for a beautiful and sentimental treasure. 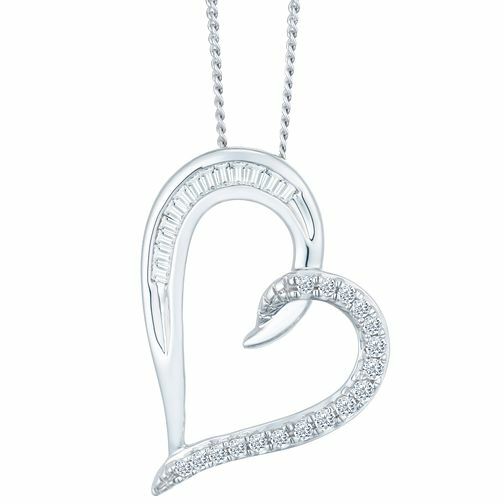 9ct White Gold 0.15ct Diamond Heart Pendant is rated 4.0 out of 5 by 1. Rated 4 out of 5 by Anonymous from Pretty pendant but------------ I was delighted when I was given this diamond pendant heart as it is our Diamond wedding anniversary in August 2019, but was so disappointed when it took me nearly twenty minutes to open the fastener! The receiving ring was so tiny and the actual fastener almost impossible to hold open so that I dare not try it on. Having contacted customer customer for advice, I took the pendant to your Chichester store, where a very helpful assistant also found it difficult! She tried various other chains but to no avail the link on the chains simply would not go through the link of the pendant? So the end result was that I had to purchase a different and rather more expensive necklace with a bigger fastener or find another pendant! Why put such tiny links on chains so that only the nimblest of fingers can, with ease, open it?